Last week Mill Creek Entertainment targeted Apr. 3 as the street date for its first DVD and Blu-ray priced-to-collect product offering for the month, the four-film collection titled Charles Bronson 4 Movie Collection. Available as both double-disc DVD and Blu-ray editions, these sets contain director Terence Young’s The Valachi Papers, director Michael Winner’s The Stone Killer, director Tom Gries’ 1975 thriller, Breakout and auteur filmmaker Walter Hill’s 1975 Depression-era fight drama, Hard Times. Wow, that’s a hell of a start to the month! It just got even better … where do you start? How about the Apr. 3 priced-to-own Blu-ray collection from Mill Creek Entertainment titled 80s Overdrive: 6 Movie Collection! The SRP is just $19.98 for six hit films from the ‘80s, you can’t beat that for value. So what are the golden nuggets included in this four-disc Blu-ray collection? We kick off with director Matthew Robbins’ 1985 action hit, The Legend of Billie Jean, which teams Helen Slater (Supergirl, Ruthless People, City Slickers, etc.) with Christian Slater in a tale of a prank and petty vandalism that spins wildly out of control. Next up is director Richard Benjamin’s 1988 Cold War spy thriller, Little Nikita, starring River Phoenix as the son of Soviet sleeper agents who has no idea who his parents really are … Sidney Poitier co-stars as a F.B.I. investigator trying to solve the case. For beach fun there’s director Mark Griffiths’ 1984 comedy, Hardbodies, featuring Grant Cramer (Killer Klowns from Outer Space, Lone Survivor) as a guide to three middle-aged guys — Gary Wood, Michael Rapport and Sorrells Pickard — who are trying to score with “beach chicks.” Also on the “beach front” is director Sean S. Cunningham’s 1983 comedy, Spring Break, featuring Paul Land and Steve Bassett who face a similar problem during a trip to Fort Lauderdale during spring break. Last, but certainly not least in the 80s Overdrive: 6 Movie Collection is director George Bowers’ 1985 comedy release of Private Resort, starring Johnny Depp and Rob Morrow. Also on the Blu-ray release front from Mill Creek Entertainment on Apr. 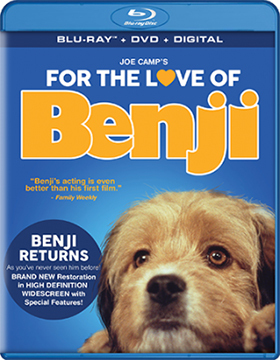 3 is a newly restored Blu-ray/DVD Combo Pack edition of writer/director Joe Camp’s hit follow-up to Benji (available from Mill Creek Entertainment on Feb. 13), the 1997 sequel, For the Love of Benji. Also heading home on Blu-ray on Apr. 3 is director James Hill’s ultra-rare 1966 Sherlock Holmes thriller, A Study in Terror, starring John Neville as Sherlock Holmes, with Donald Houston as Dr. Watson. The game is afoot as Holmes is pitted against Jack the Ripper!! !